The Isle of Tokkou 1 refers to Otsushima, a small island in Tokuyama Bay in Yamaguchi Prefecture. In 1944, the Japanese Navy established a top-secret base on Otsushima for kaiten, manned torpedoes to carry out special attacks (tokkou in Japanese). A submarine could carry four to six kaiten, described in the book as huge steel coffins with pilots having a zero percent chance of returning alive after being launched. 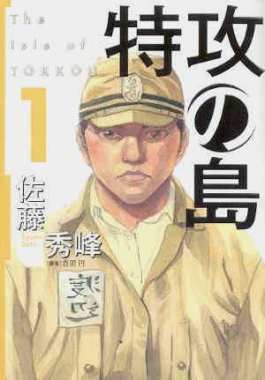 The Isle of Tokkou 1, a historical manga book that includes episodes originally published in Shuukan Manga Times magazine, focuses on the relationship between Lieutenant Junior Grade Sekio Nishina and the fictional character Yuzo Watanabe. This manga book, the first in a series, covers the training period prior to the first kaiten attack, which took place at Ulithi on November 20, 1944. Lieutenant Hiroshi Kuroki and Lieutenant Junior Grade Sekio Nishina open the story by presenting their kaiten weapon plans to a Naval Staff Officer. The setting shifts then to the base for Fukuoka Naval Air Group, where 100 young men volunteer to train for a special weapon for which they will have no hope of return. When the volunteers arrive at Otsushima, Commanding Officer Itakura shows them the kaiten weapons and explains the nature of their mission. He states that all of the volunteers within a few months will ride one of these torpedoes and crash into an American warship. Nishina, with long unkempt hair atypical for the Japanese Navy, visits one of the classes for the new arrivals. He says that Kuroki, who together with him developed the idea for the kaiten, died several weeks earlier. He tells the young men that he will be first to go when the opportunity comes to sortie, and he encourages them to never forget Kuroki's last wishes. After the presentation, Yuzo Watanabe angrily approaches Nishina to find out why he created such a weapon, but Nishina remains silent. Soon after Watanabe accompanies Nishina on a kaiten training run but finds out nothing more about his true feelings. Later in the day at sunset Watanabe discusses the kaiten's many defects with his friend Sekiguchi. When Watanabe returns to the barracks, he drifts off into a daydream as he sketches some scenery. The dream ends with his mother asking him what he really wants to do, and he stares at a blank page in his sketchbook as he thinks about the question. The other men have gone to sleep, so he goes over to the torpedo maintenance area, where he finds Nishina engrossed in his work on a kaiten. Nishina invites Watanabe to view Lieutenant Kuroki's writings on the inside hull of this kaiten, which had gone out of control on a training mission and stuck at the bottom of the bay. Kuroki died before the kaiten could be recovered. Watanabe gets assigned to a second training run with Nishina. Inside the kaiten prior to launch, Watanabe questions Nishina several times until he explains his true feelings toward the kaiten. Nishina tells Watanabe that he wanted to be Lieutenant Kuroki, who totally devoted himself to the development of the kaiten. 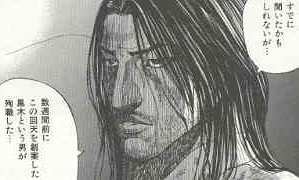 He says that when he first read Kuroki's last letter written at the bottom of the bay, he felt neither saddened nor impressed but rather in despair. When Kuroki's dead body was removed from the kaiten, Nishina saw in Kuroki's features a real calmness in the face of death. Kuroki died as a martyr, continuing to write useful information regarding the kaiten's failure until oxygen ran out. Nishina considers himself a mediocre person in comparison to Kuroki, who gave his life with conviction. After telling his story, Nishina asks about the reasons for Watanabe's conviction. Watanabe replies that he burns with life so that he can make his life his own. The book ends as they start their second training run together in the kaiten. The characters in this manga book thoughtfully discuss the reasons why they willingly plan to go to their death in a kaiten weapon. Although the main characters appearing in the book are based on actual history, the author Syuho Sato writes up front that some of their ideas, beliefs, and feelings presented in the story differ from those of the historical persons. The accuracy of the book's characters and drawings reflects the author's thorough research, including obtaining information from a couple of books on kaiten history and from the Kaiten Memorial Museum in Otsushima, the National Kaiten Association, and Yasukuni Jinja Yushukan Museum. Some of the manga characters' features are somewhat exaggerated, such as Nishina's shoulder-length hair being longer than that shown in historical photos, but the kaiten drawings and Otsushima scenery generally appear quite realistic. Volume 1 ends in the middle of a kaiten training run, and this thought-provoking manga story continues in Volume 2, published five years later.